Can Gameplay Get In the Way of the Story? The credo of many talented designers is "gameplay first," but what happens when you're just playing a game to find out what happens next? 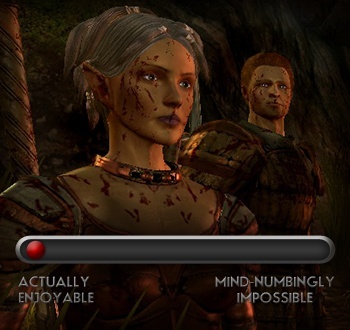 With Dragon Age and Mass Effect 2, the gameplay was actually intruding on my fun. I wanted to be talking at the Landsmeet or finding out what made Miranda tick, not pausing every few seconds to reissue orders to Alistair and Morrigan, or crouching behind low walls, taking pot shots at combat droids. Having realized this about myself, though, is actually quite liberating. I pre-emptively turned down the difficulty on Heavy Rain, for example, because I was more interested in finding out who the Origami Killer was and rescuing Ethan's son than I was in tying my hands in knots during the quick time events. (Although thanks to the wording at the beginning of the game, I mistakenly set the game on hard anyway. Note to David Cage: Being familiar with the PS3 controller is not the same thing as wanting to push ninety gajillion buttons to climb a muddy embankment.) Knowing exactly what I wanted from a game, and being able to take steps to make the experience that much more appealing was pretty exciting. To read more about how the game can sometimes get in the way of a good yarn, check out "Playing for the Story" in Issue 254 of The Escapist.